Over the years, I’ve been fortunate to know my buddy Lance, the Louisiana Connection, we’ve built a good rapport and I’ve been fortunate to call him my friend, we’ve exchanged autographs back and forth and attended events together. Our ‘future consideration’ exchanges are completely spontaneous and come with no strings attached. He decided to take a shot on the Louisiana Sports Hall of Fame dinner, and hit pay dirt with both Ed Reed and Eddie Kennison who were at the event. They both signed a few cards for Lance, and he was kind enough to package them up and send them to me. I can not emphasize enough that one of the greatest unsaid rewards of this hobby is the friends and the connections you make with other likeminded and selfless collectors. Ed Reed is one of the greatest safeties of all time and there is definitely a first ballot Pro Football Hall of Fame jacket waiting for him. The 24th overall selection of the 2002 draft, Ed played the majority of his career in Baltimore anchoring down the free safety position. An instinctive and intelligent ballhawk, with all the intangibles and soft hands, Ed was actually the second ranked safety off the board, (Roy Williams -DAL) and Baltimore honestly wasn’t jumping up and down when he was selected, but the leader of the Miami Hurricane defense went out and proved them wrong. Over 11 seasons, Ed started 169 games and recorded a whopping stat line: 61 interceptions for 1541 yards and 7 TDs. Along the way he led the league in interceptions 3 times, yards twice, and had a 106 yard TD and a 107 yard TD. He earned All-Pro Honors 8 times, and Pro Bowl nominations in 9 seasons. Like many greats, Ed Reed faced a conumdrum after the 2012 season. The Ravens hot off their latest Super Bowl appearance couldn’t pay Ed Reed to stay. He decided to test the free agent waters. Enter the Houston Texans. The Texans had a habit of swinging for the fences on free agent pickups, typically dubbing them as ‘the final piece’ to a championship run by the front office brass- and then deeply overspending for them. With up and coming reasonably priced Glover Quin bolting in free agency for Detroit, the Texans brought up the Brinks truck to Ed Reed’s house and dumped the cash. Reed signed a 3 year contract in 2013, and then underwent arthroscopic surgery- surprising many in the Texans camp. Ed made a late debut in the Texans defense, but the team was already spiraling out of control. While Ed was a vocal leader of the defense, and was to mentor young safety DJ Swearinger, he had zero impact on the defense. In 7 games he appeared in, Ed had 16 total tackles. The Texans had enough of the Ed Reed show and cut him. He’d be picked up by the Jets and finish his season with the team. During his short stint in NY, Reed added another 3 interceptions to his resume, retiring after the conclusion of the 2013 season. While the ending of Ed’s career was not what anybody wanted, the volume of his production in Baltimore can not be overstated. Beggars can not be choosers, and I value this gift that Lance gave me. 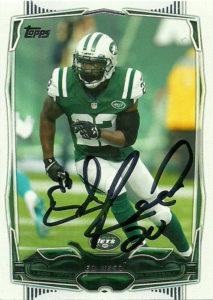 Ed Reed in a Jets card looks odd though. I would’ve accepted a Texans card just the same, but Ed is iconic in his Baltimore regalia. Topps went through a slow evolution during this period, making minor tweaks to their design each year. It’s not a bad look, but it really feels like the front end of a car I’m looking at. The design is pretty embellished nicely, if not a bit too much. It’s a decent but not really a memorable set, although in the future it maybe regarded as something typical of this era.